Feel free to ask me a n y t h i n g you have always wanted to ask a pro ! I will try to answer to the best of my knowledge and in the least amount of time possible (it really depends on where I am at the moment that you send me your question and on my schedule, duties and of course internet connection)! And hey, no worries, I won’t post your question publicly unless you don’t mind me doing so in order to share with other kitesurfers around the globe! In any case, I would like to draw your attention to one of my articles published in several languages (German, English, French, and Russian) with the title ‘Myth: Kite Pro’, a funny write-up about the life of kite-professionals. You can read the PDF in my publications portfolio. Please note: not everything in the article should be taken deadly serious 🙂 Click here for the article in German, English, French, and Russian ! Have fun & I look forward to your questions! As I know you are from Austria I have decided to write to u in German as my English is pretty poor, it’ much easier for me to ask what I really would like to ask you and also understand your answer 🙂 Ok, ich denke, das Leben als Kitesurf Pro muss unglaublich sein, eigentlich ein wahrer Traum, denn Pros bekommen ja praktisch dafür bezahlt, worauf sich unsereins das ganze Jahr freut bzw. spart (den Kiteurlaub an einem windigen Platz). Wie ist das? One-for-all-conditions-kite-era, truth or lie ? I only have a 14m2 bow kite. My friends are going to Morocco this summer and I would like to join them. However, I’ve heard that it’s super windy there at this time of the year. I’ve been told my bow has an over-average wind range, thus, would think I can hold it in about 30 knots +. I have been kiting for a little less than 1 year and would consider myself as a good beginner to an intermediate kiter. What do you think? I wanted to enter in the up coming nationals that will be held close to where I live, back here in my home town in France but my dad won’t let me do it because he doesn’t think I’m a good enough kitesurfer for a contest, even though I just want to participate in it to have fun and meet new friends. How do I convince him to let me do the contest? Newbie to kiting – info on wetuits !? 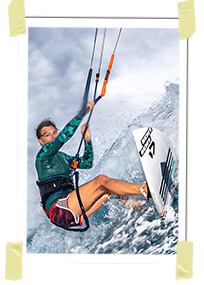 Ok I am a newbie to kitesurfing and need info about wetsuits, can you help? I have recently started kitesurfing, I am still training and trying to learn all that I need to know before going to travel abroad to the spots that I’ve read so much about in magazines. For my trip, my friend told me I should invest in a wetsuit. Ok I wont lie I am fat 5’7 195lbs and I need to know what size to buy. Is it like shirts? Would I buy a XL since thats my shirt size??? What are the purposes of them besides keep you warm in the water?? And finally what brand would you recommend? I dont have much cash so I prob cant afford Quiksilver…? I would like to get into wavekiting. Close to where I live there’s a popular surf spot, which is usually crowded with pretty good surfers. When the wind picks up later in the day, the surfers usually leave and are replaced by some local windsurfers, however I have never seen any kitesurfer out there. Both, surfers and windsurfers love that spot which is a reef break that’s most of the time really pumping. Any tips for my first attempt today?